The Mitsubishi MINICAB MiEV is a new electric van presented by the Japanese manufacturer in 2011. The vehicle is based on the conventional Minicab CD van, but unlike its donor which is sold only on the Japanese market, the MINICAB MiEV van will be also available on the global market. Mitsubishi has announced that it is developing a plan to produce a version of the Minicab-MiEV for Suzuki in Japan, but this model will be sold only in its home market. The MINICAB MiEV comes with a choice of two batteries that offer different cruising range. The batteries are mounted under the floor to maximize load volume, while the motor inverter and other EV components are placed under the cargo compartment. The vehicle has a payload of 350 kg which is basically the same capacity offered by the fuel powered Minicab CD Van. The MINICAB MiEV was initially launched in Japan with an MPSR ranging from $ 30,800 to $38,200. The vehicle shares the same exterior design with the Minicab CD Van and looks typically Japanese. Its Tonka Toy exterior style is enhanced by a boxy shape and the short nose. The headlights are placed higher than usual, but they look pretty modern and are nicely integrated into the front fascia. The front grille didn’t receive any sort of fluid lines and comes with a basic rectangular shape, while the three diamond logo it’s placed in its center. The front bumper is big and imposing, featuring a vertical stance and a rugged design. The vehicle is placed pretty low to the ground to make loading and unloading operations easier. To offer more flexibility the Minicab i-MiEV van it’s also fitted with standard sliding side doors and twin rear doors that offer easy access to the cargo bay. At 3395mm long, 1475mm wide and 1810mm tall (1915mm in high-roof guise), the Minicab-MiEV is pretty compact, being 760mm shorter and 180mm thinner than the Suzuki APV which at the moment is one of the smallest vans sold globally. On the inside, the van feels pretty cramped as its cabin is heavily affected by the compact exterior dimensions. There are however few tricks which help the interior feel slightly more spacious and practical that it really easy. For instance the dashboard features an ergonomic design which maximizes the use of space, being fitted with cup holders, cubby holes and even a small glove box, all helping you to store your stuff safely. 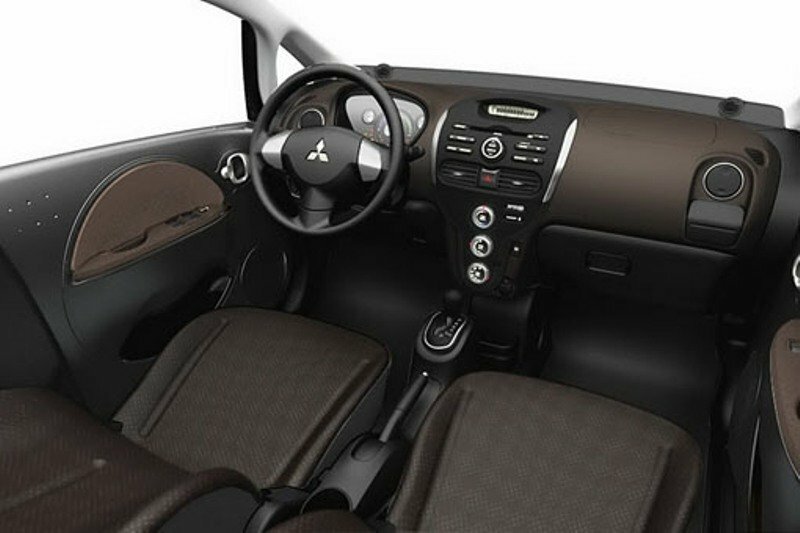 The materials are of course part of the third class, as Mitsubishi wanted to cut the costs of its electric minivan as much as it could, but the build quality isn’t bad and the fittings are pretty well done. The instrument cluster features an attractive design and looks pretty futuristic keeping you posted on various vehicle stats including a Digital Speedometer, Power Meter, Drive Battery Residual Charge Indicator and Available Range displays. You won’t have any complains about the controls and switches either, as everything is in the right place. The driver can use a drive selector to choose from three driving modes namely "D," "Eco," and "B." This allows you to choose between normal operation, lower output/energy-saving operation, and operation in which the regenerative brake bias is increased. While driving, you’ll hold an attractive three spoke steering wheel which looks great and ads a dose of sportiness in an otherwise pretty dull atmosphere. The seats aren’t the most comfortable units you’ll find around and leg room is more on the cramped side, as well. Mitsubishi tried to improve this issue by adding a wide range of adjustments, but don’t expect to any wonders. At least the road visibility is excellent and we like the huge windscreen and the generous lateral windows. The door mirrors are also up to the task and they manage to cover all blind spots, keeping you well informed of what’s going on behind. The Mitsubishi MINICAB MiEV’s motor delivers a maximum output of 30 kw (41 hp) between 2500-6000 rpms. The biggest advantage offered by the electric vehicles is that maximum torque is available instantly from the moment you start the motor. 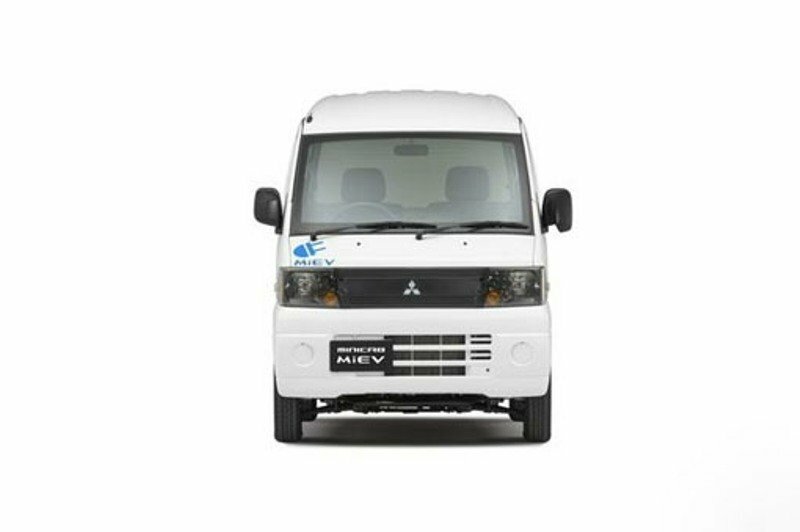 Mitsubishi’s electric van can churn out a peak torque of 196 Nm which is available at its peak between 0-3000 rpms, delivering pretty capable towing abilities even when the van it’s fully loaded. 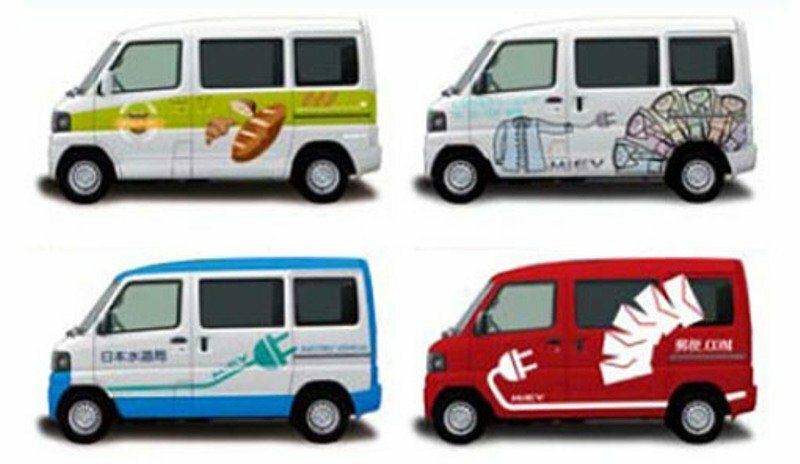 Thanks to its electric nature, the MINICAB-MiEV van is very quiet which makes it the ideal commercial vehicle for transporting delicate goods or delivery work early in the morning or late at night in residential districts. 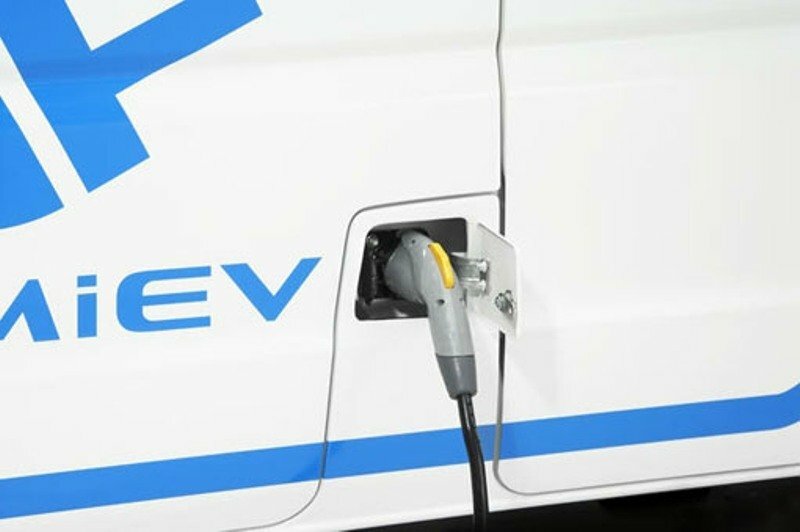 The MINICAB MiEV shares the same components with the i-MiEV including drive battery, motor, inverter, on-board charger, air-conditioner and rear suspension. The MINICAB MiEV comes with 10.5 kWh and 16.0 kWh lithium-ion drive batteries which provide a cruising range of 100 km and 150 km, respectively. The smaller lithium-ion battery needs 4.5 hours to charge fully from a standard power point and 15 minutes to fast-charge to 80 per cent. The longer-range model takes seven hours to charge and 35 minutes to fast-charge to 80 per cent. The vehicle is also equipped with a regenerative braking system that can use the motor as a generator during braking and store the recovered kinetic energy as electricity in the drive battery. The new Mitsubishi MINICAB MiEV is an interesting option for those seeking for a compact commercial vehicle which is able to deal well with city deliveries. It’s true that the vehicle has its limitation when it comes to payload capacity, but its efficient nature makes it a smart choice for those who want to cut the costs of commercial transportation to minimum. Judging by micro vans standards, the cabin is pretty good too and has anything it needs to offer a decent driving experience. The engines are also pretty torquey and even if they aren’t as lively as their conventional counterparts they still offered adequate performances. The only problem with electric vehicles remains the maximum range offered by the batteries, but the MiEV’s 100 km and 150 km range should be enough to keep you out of trouble in urban areas.